If you have followed my blog for a while, you may recall that last October I purchased a 1936 Dorsey under the mistaken impression that it was a Cameron. I have a very special Cameron in my life and that's the only model, at least in the men's line, that is a family name. So my pursuit for a Hamilton Cameron continued. There are actually two Cameron models but the first one was released in 1937 and produced through 1940. 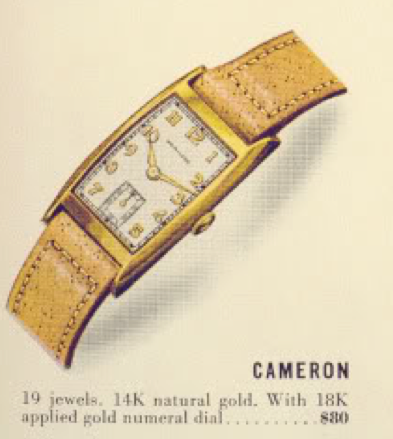 The Cameron comes in a solid 14K gold case and depending upon the year, both white or yellow (natural) gold was offered. 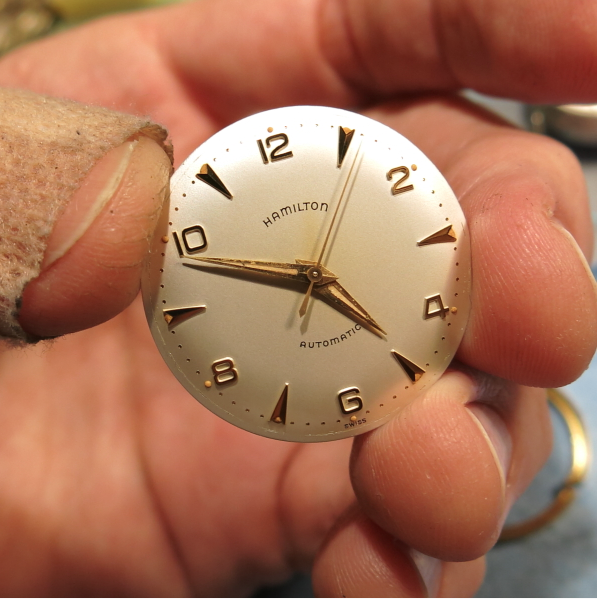 Only one dial was available, the sterling silver dial with solid 18K gold applied numerals. I recently received a Cameron in need of some tender loving care. It came on an old expansion bracelet - which wasn't original to the watch so it will have to go. I don't care for bracelets because they tend to wear into the watch lugs if they're not a perfect fit (and even if they are). 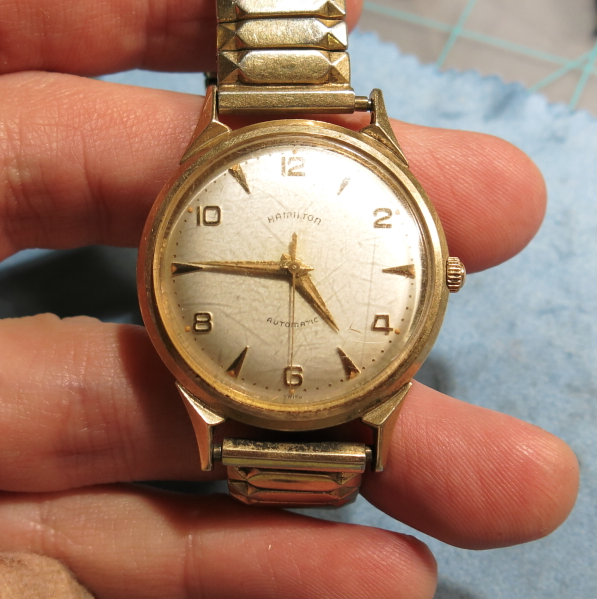 The dial is very dirty and based on it's looks I can't really tell if it's original or a very old refinish. The mottled patina in the field makes me wonder if the watch was attached to a smoker's wrist - maybe it's just nicotine and will clean off? 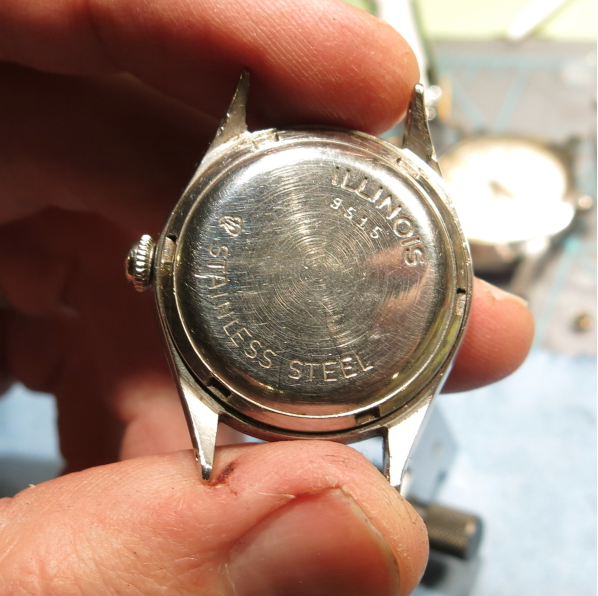 With the dial removed, there are no marks on the reverse and it looks untouched - so I'm going to say this dial is an original. 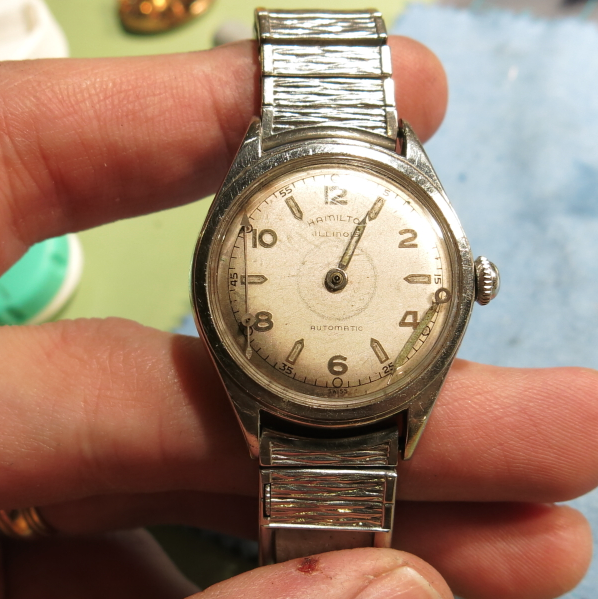 That's good, because original dials usually clean up better than a refinished dial. 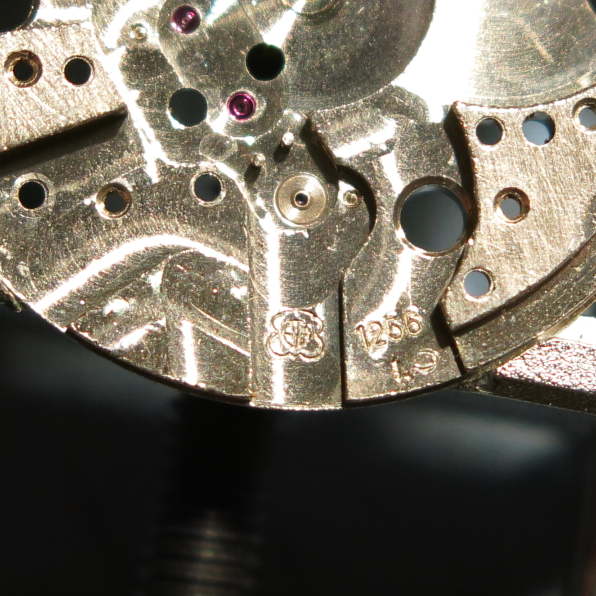 The 19 jewel 982 movement is correct for the watch and the serial number dates to 1938, perfect for a Cameron. 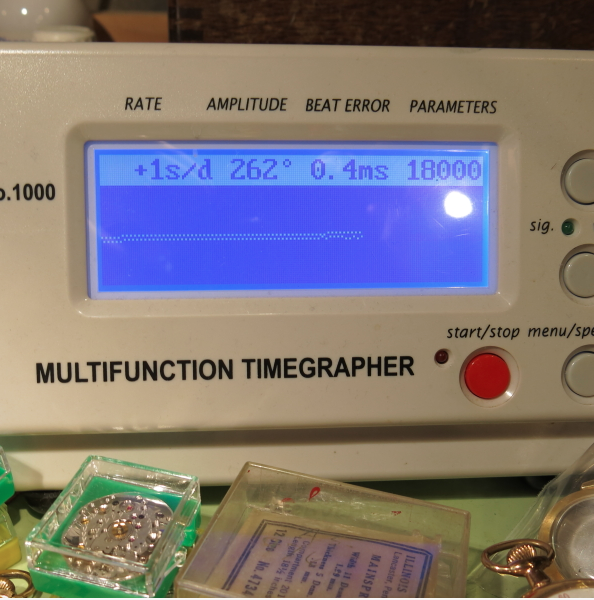 Although the watch is running, it's running very poorly. 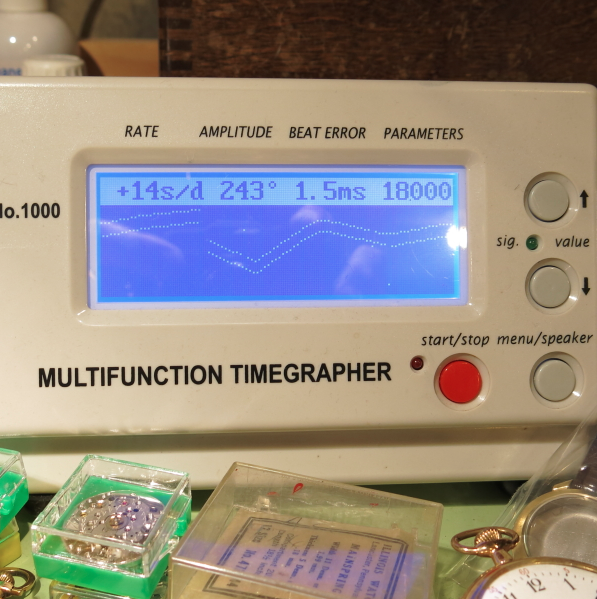 With the watch on my timer you can see the tell tale sign of a shot-gun pattern of noise. It should be two lines, fairly close together. 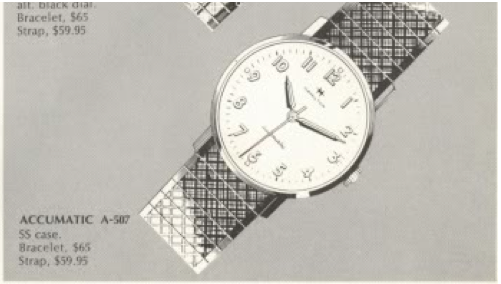 So this watch really needs help. Uh oh - this model happens to have female spring bars. That means there are pins in the lugs, as opposed to holes. Replacing these spring bars is a challenge as the holes in new spring bars are usually too small and need to be enlarged to accommodate the size of the male pins. Here's a shot of the pins. 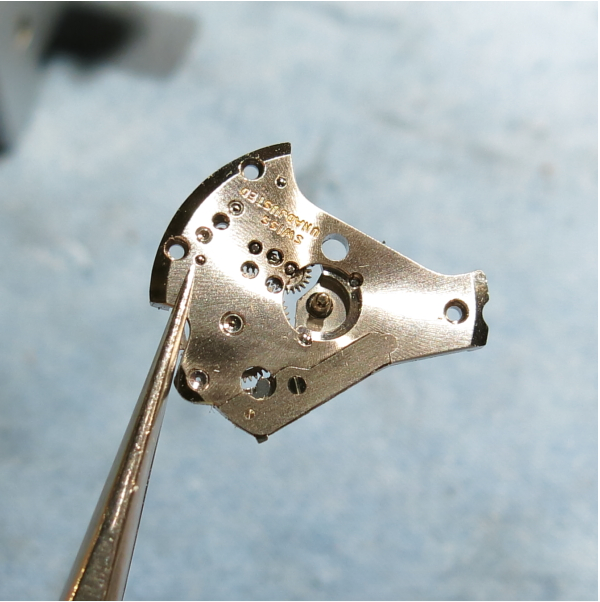 The female bar will fit between the pins and then expand over them to secure the new strap. Sometimes you get lucky and can reuse the old spring bars. But not this time, these spring bars are shot. 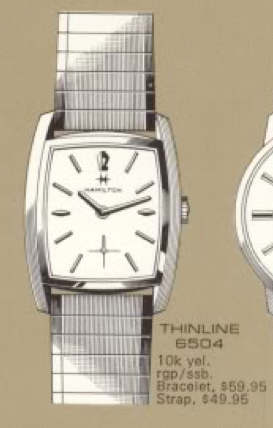 I wouldn't risk a valuable watch to potentially falling off because of worn out spring bars. 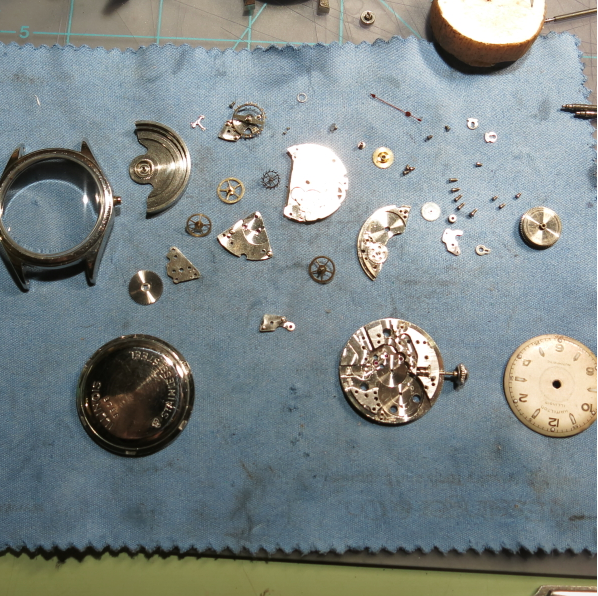 While everything is being cleaned in the ultrasonic, I'll turn my attention to the case and replacing the crystal. First, I'll polish the case. With the case all spiffed up, a new glass crystal will be fitted for the bezel and glued in place with UV glue. 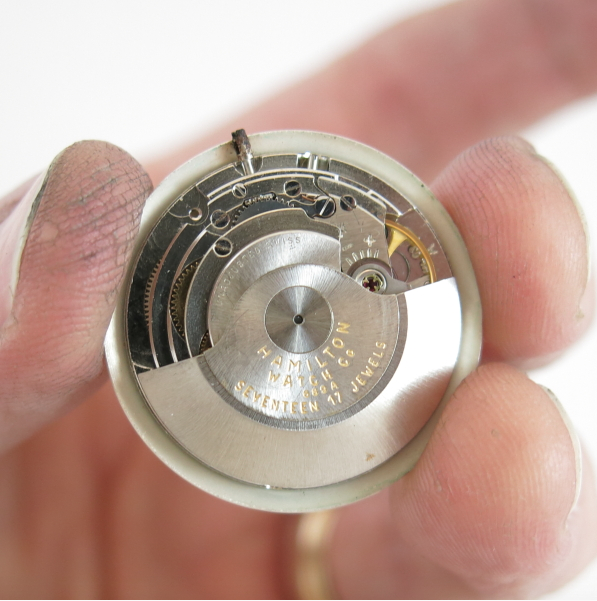 Not surprising, the mainspring is set - it's in a coil about the size of a nickel. 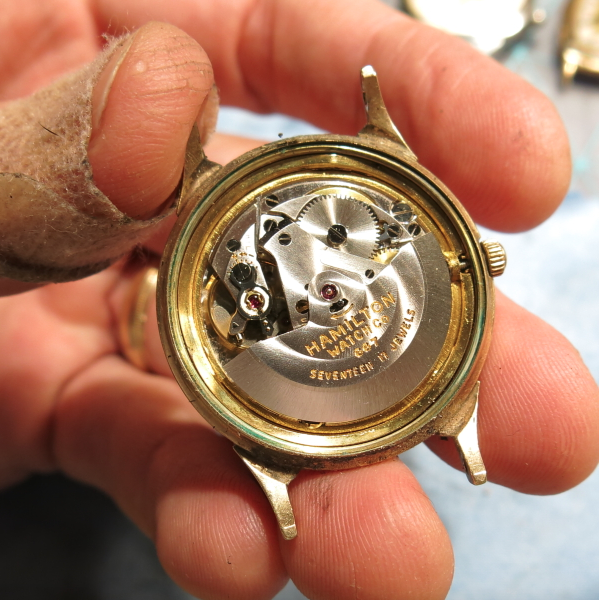 A new mainspring will dramatically energize this 76 year old watch. My first choice for mainsprings is a white alloy (unbreakable) Dynavar spring. Everything is cleaned and dried so all that's left is to reassemble everything. 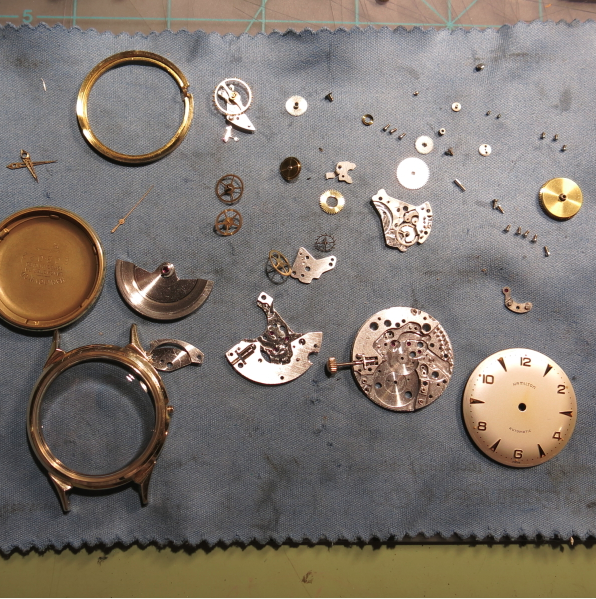 A good cleaning returned the watch to vigorous life. It's running a little fast right out of the chute but a little tweaking to the regulator will slow it down. Here, from right to left, you can see the effect of my moving the regulator as the slope of the two lines slowly moves towards horizontal. Gone is the shot gun pattern - thank goodness! 23 seconds fast per day is a good set point for now. It will probably settle in as it runs longer. 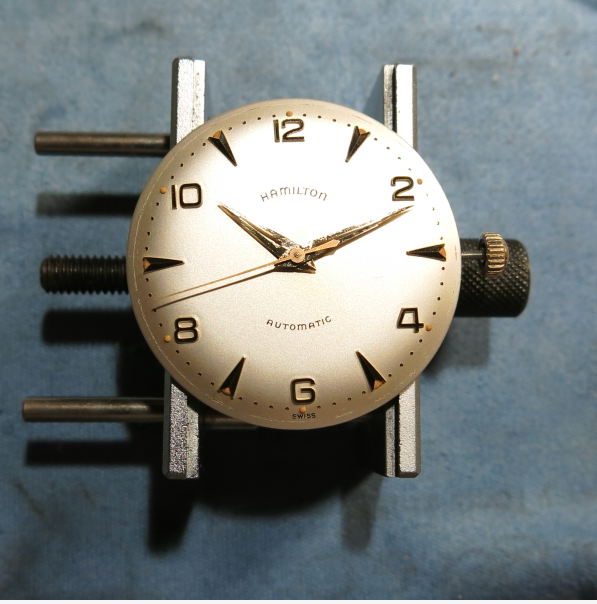 Now that I know the watch runs properly I can move on to the final task of modifying new spring bars to fit over the male pins. 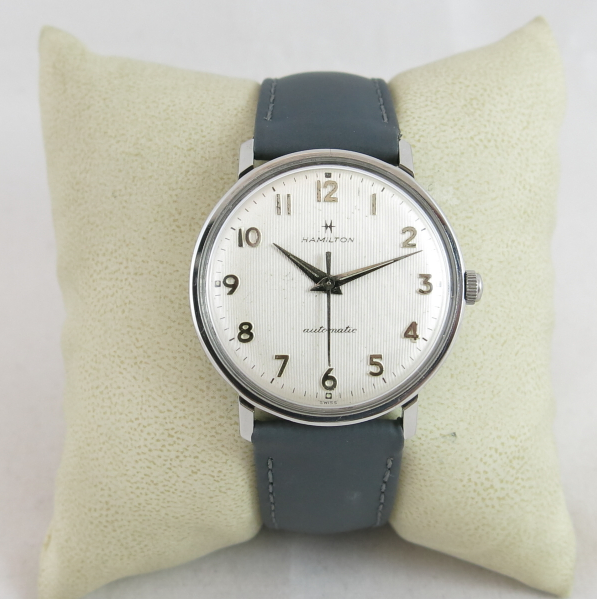 And here's the finished product paired with a new old stock vintage Hamilton pigskin strap, just like what would have come on the watch in 1938 (as shown in the catalog image above). 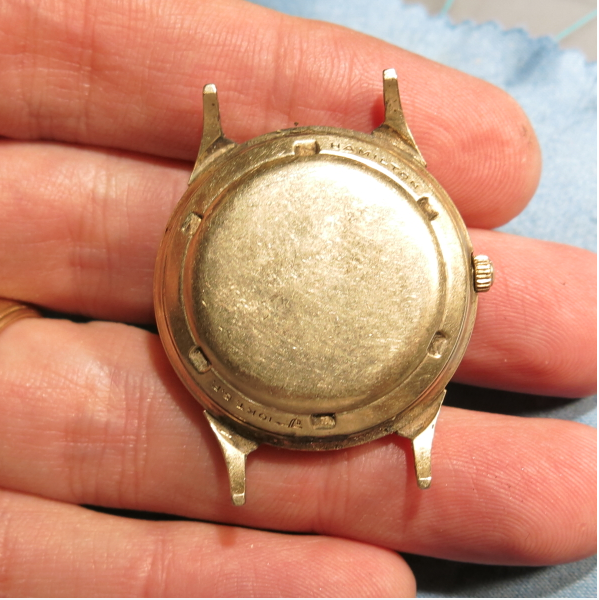 The dial cleaned up very nicely, I think. 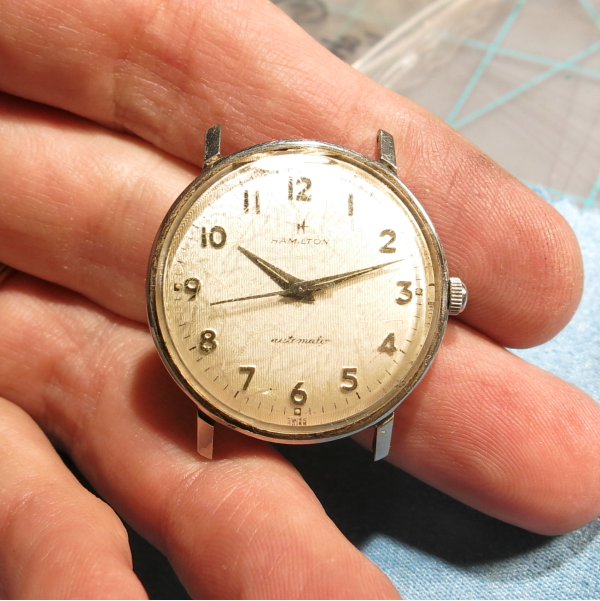 This watch is ready for another 76 years of faithful service! 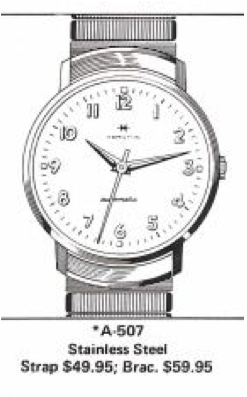 Hamilton's Automatic K-series of watches was introduced in 1954 and extended into 1961. 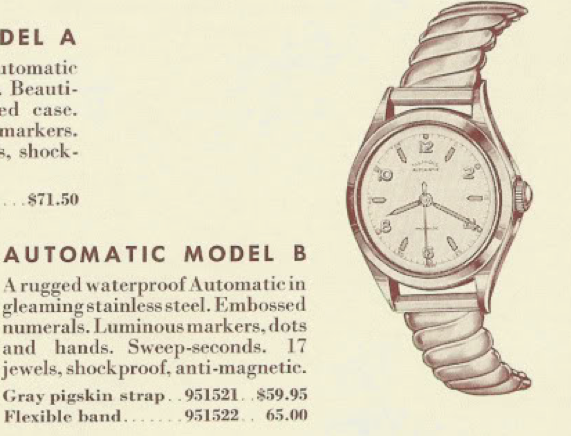 There are 58 different Automatic K-something models - and even more when you consider dial variations. 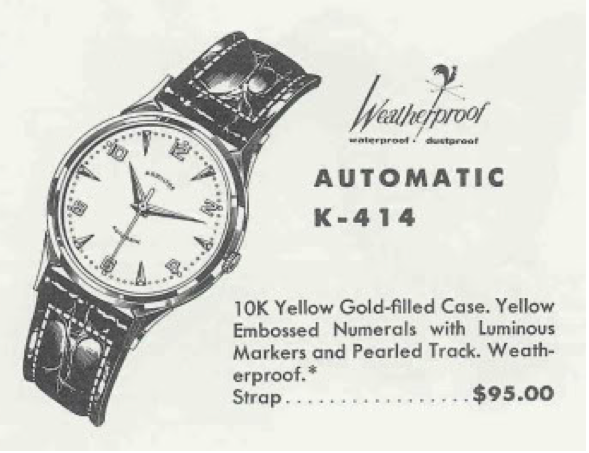 One of the K-watches that entered toward the end of the run was the Automatic K-414. It was produced for only one year - 1960. 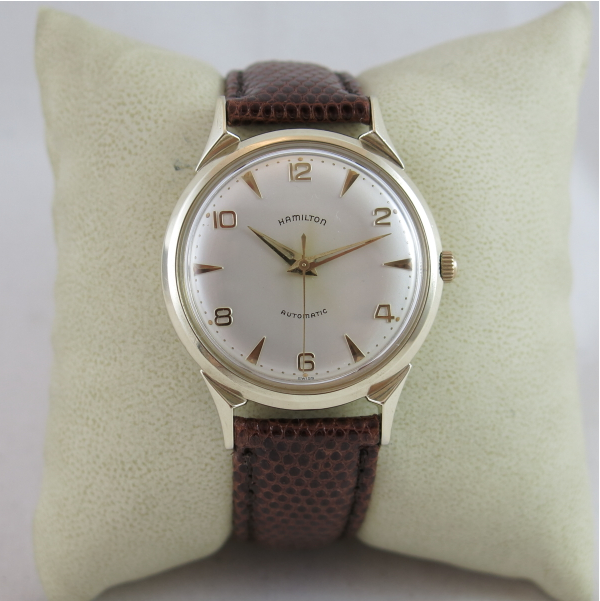 The K-414 came in a 10 yellow gold filled case with a white dial. 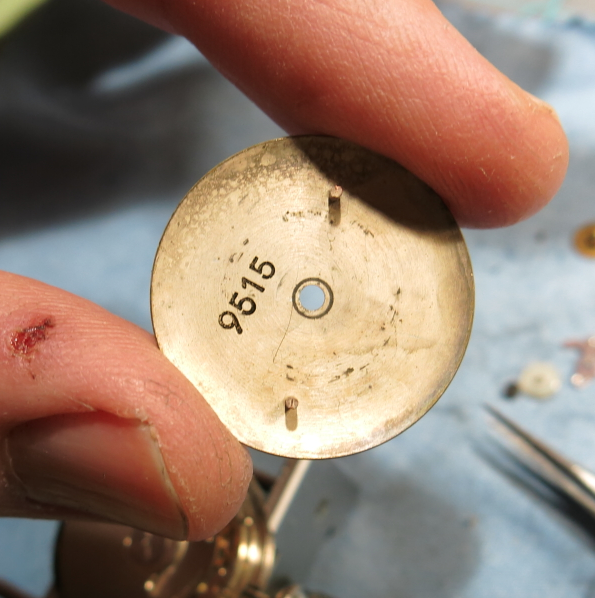 The dial has yellow embossed numerals and markers with a pearlized track. The hands and dial are lumed as well. 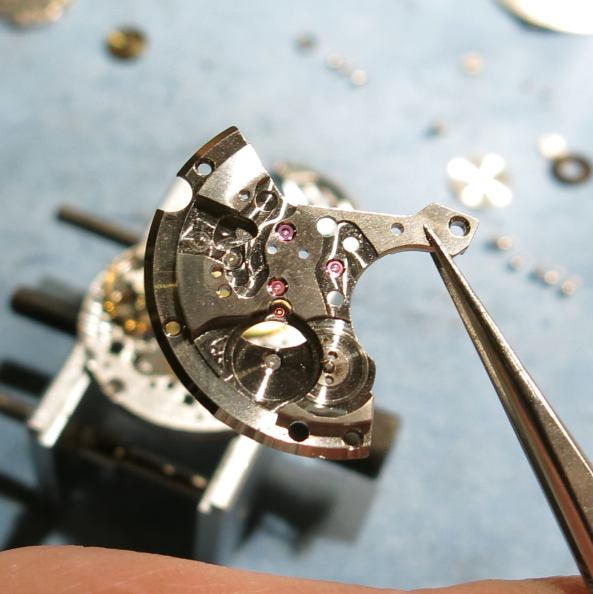 Behind the dial you will find a 17 jewel Hamilton 667 Swiss-made movement. 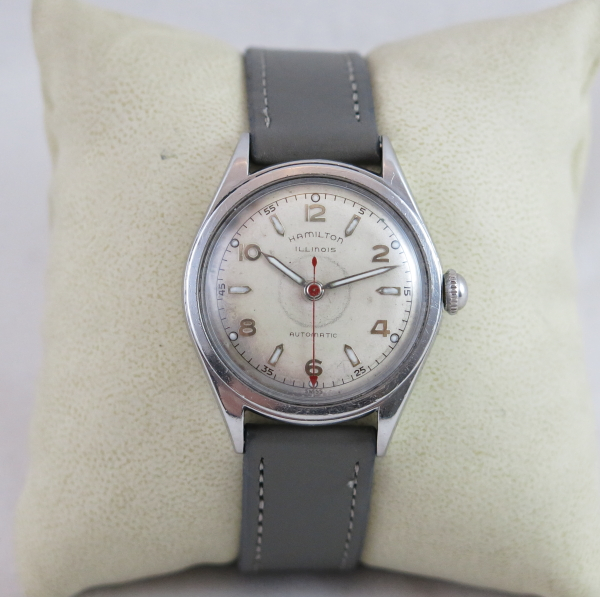 It's a variant of the 661 and 665 made by Kurth Freres (Certina). If you look over in the menu on the right, I have posted a number of "Overhaul threads". 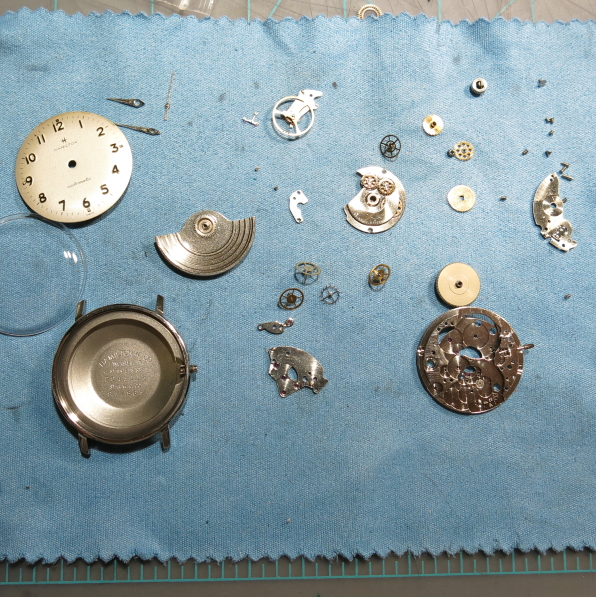 These show set-by-step how I disassemble and / or reassemble a movement - in case you ever wanted to try your hand at it. I haven't done a 667 before so I'll show you in detail what's involved below. I recently purchased a project K-414 from a local favorite shop. One of the proprietors was kidding me about the great deal I got on the watch and told me when I left I would be "driving a getaway car". Actually I paid a fair price ($50) considering the shape that it was in. Although it was extremely dirty, it was running - but you never really know how well until you see it on a timer. The back of a K-414 screws off. These can be a real bear to get off sometimes, depending on the condition of the gasket inside. Fortunately for me, I was able to open it without much difficulty. Wow, this movement is surprisingly clean. Once out from beneath the beat up crystal, the dial and hands actually look really nice. 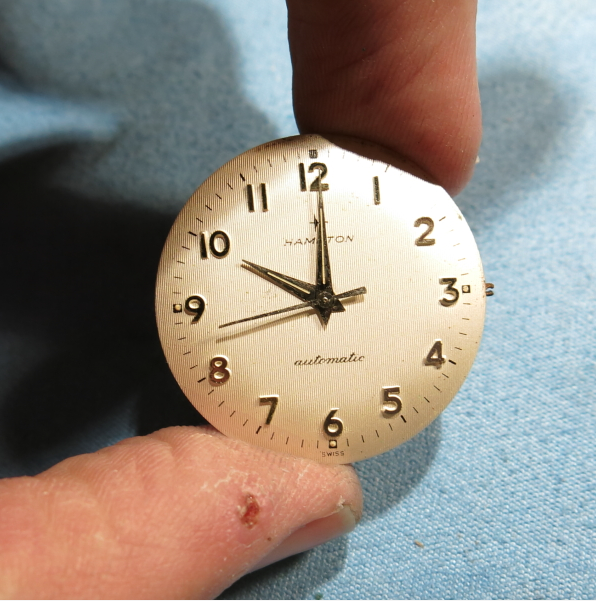 The dial has a slight case of radium burn from the hands. I'll remove the radium in my cleaner so that will put an end to that. 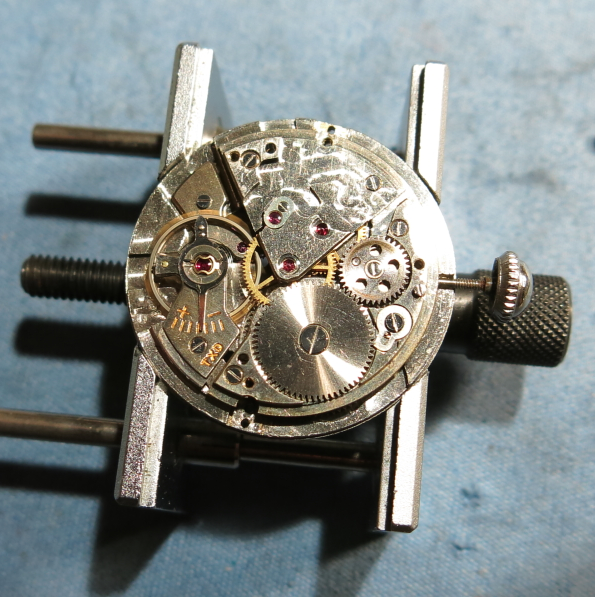 First to come off the movement are the hands, then the dial, and the hour wheel / cannon pinion below it. Switching to the back, like the 661, the rotor is really easy to remove from a 667. You just "flip the switch" and rotate the rotor until it lifts right off. 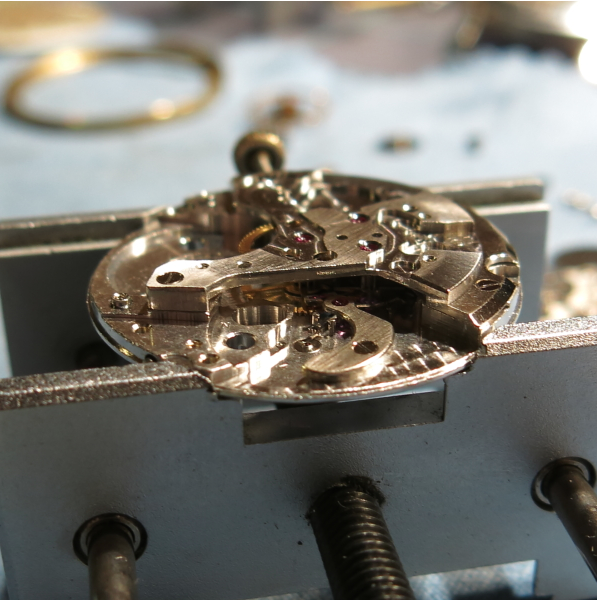 That leaves the movement below with an exposed rotor carrier. Three screws hold the rotor carrier on. 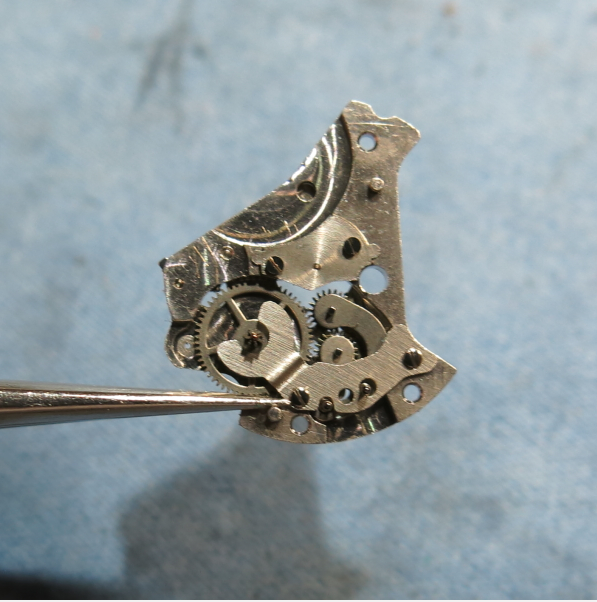 The other side of the rotor carrier shows the business-end of how the rotor transfers motion through the series of gears to the winding wheel on the movement. 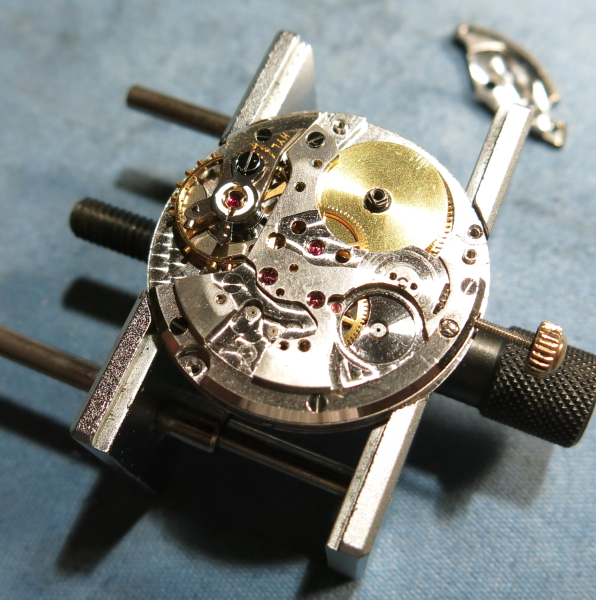 At this point, the movement is your basic manual winding movement. 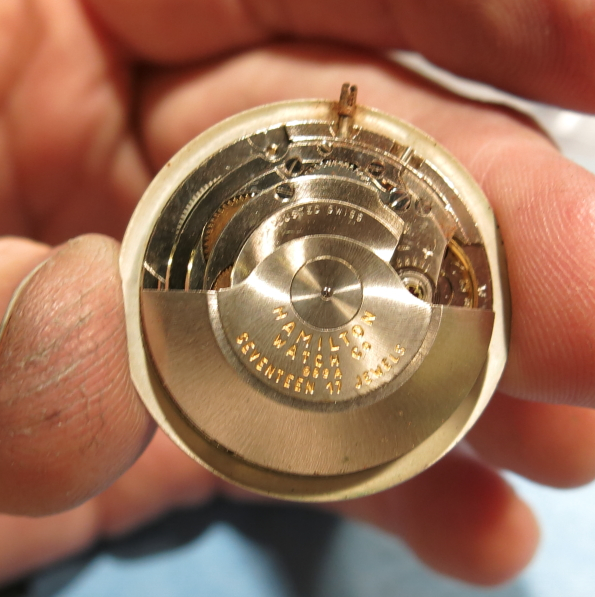 The gold ring on the right is the winding wheel. It engages the larger wheel above it called the ratchet wheel. The ratchet wheel is connected to the mainspring arbor. The wheel below the winding wheel is a clutch that allows the rotor to turn the winding wheel but not vice versa. The barrel bridge is the next to come off. Two screws hold it on. The winding wheel has also been removed. 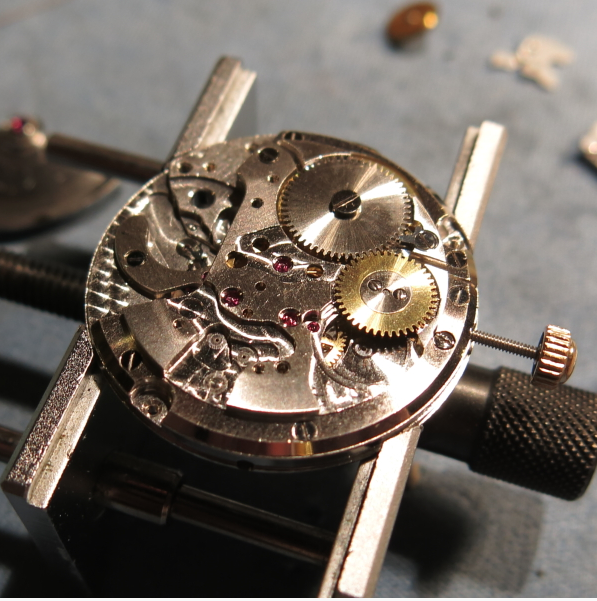 This movement has a large train bridge that is held on with four screws and encompasses the winding wheel too. 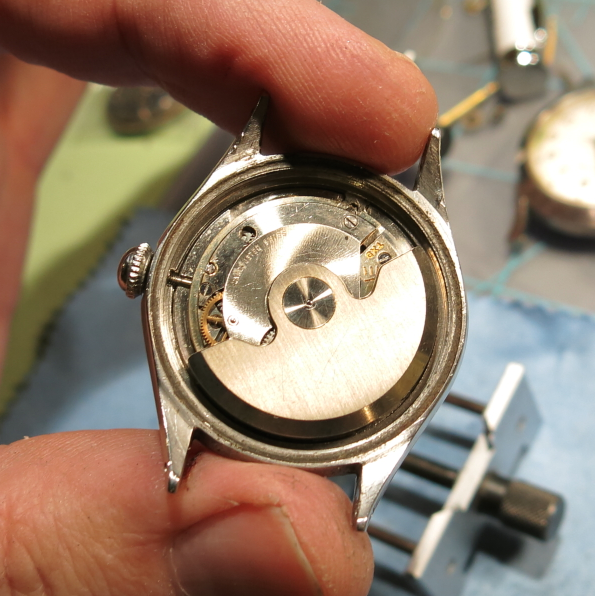 With the train bridge and barrel bridge removed you can see all the wheels in the watch. The fourth wheel in the center drives the second hand. The third wheel is next to it. They can come out now. 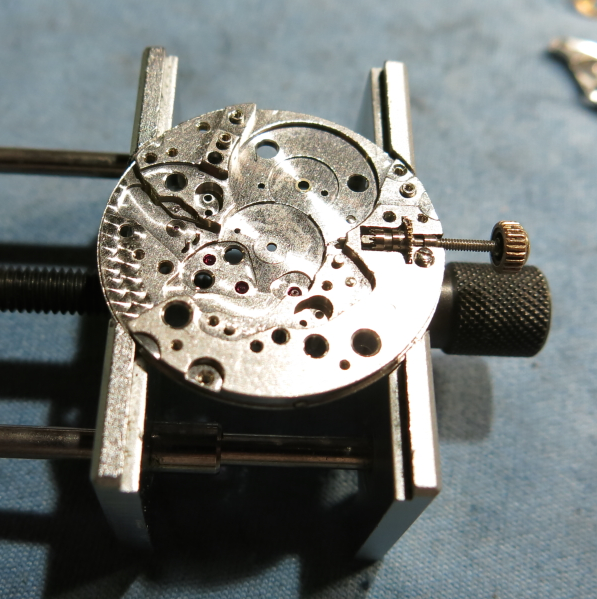 I can also take off the balance assembly and the mainspring barrel. That leaves a bridge for the center wheel. Two screws hold it on. Now the center wheel, escape wheel, and pallet fork can come out. The pallet fork is blocking the center wheel so the center wheel is the last part to come off. 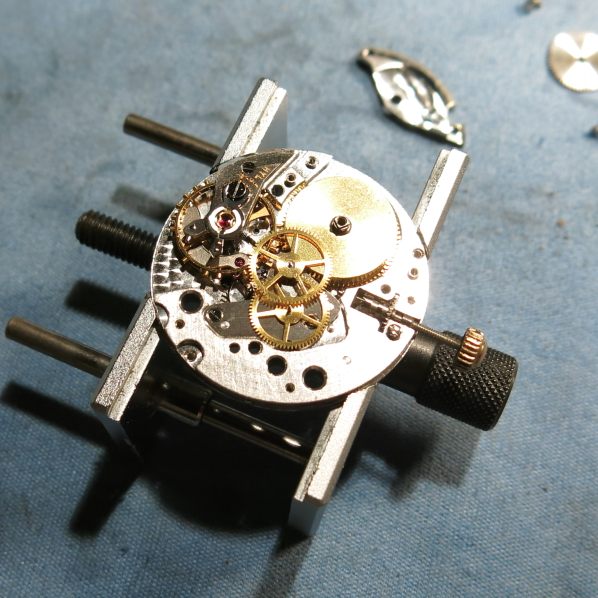 And the back of the movement is now clear of parts. Nothing to it, right? Everything gets cleaned, rinsed and set out to dry. Normally the first part I put on is the pallet fork but for this movement I have found that it is easiest to put that on after I get the other wheels installed. Installation is just the reverse of disassembly. 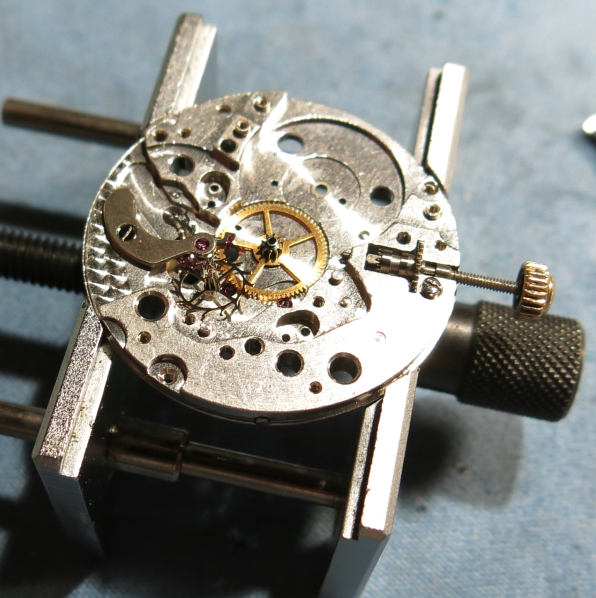 Getting all the wheels to line up can be a bugger on this movement so I find it best to tweak the parts with my tweezers from this angle - using the empty space left by the missing balance assembly. Now the pallet fork and it's bridge can be installed. 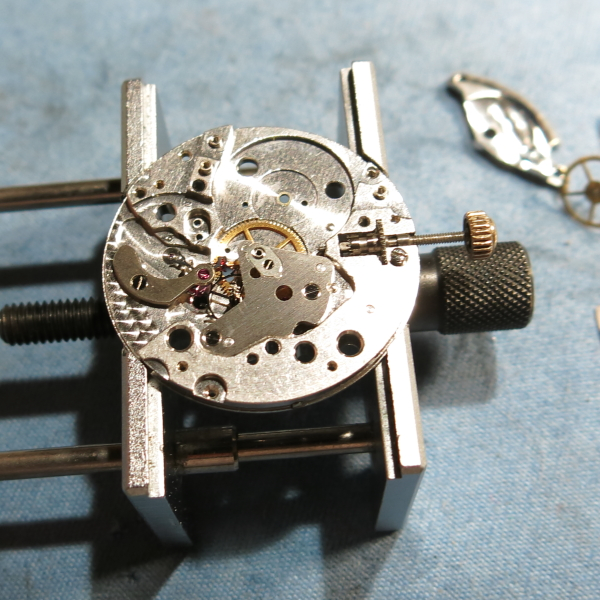 The mainspring barrel, barrel bridge, winding wheel and ratchet wheel go back on next. 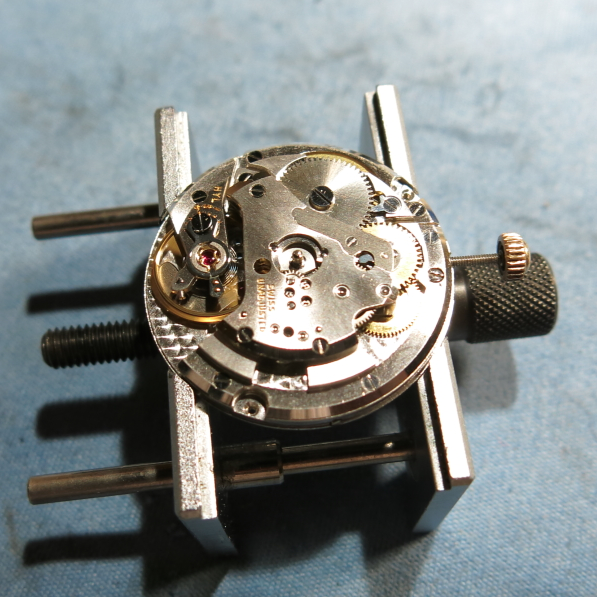 Now I can wind the watch and put the balance assembly back on. 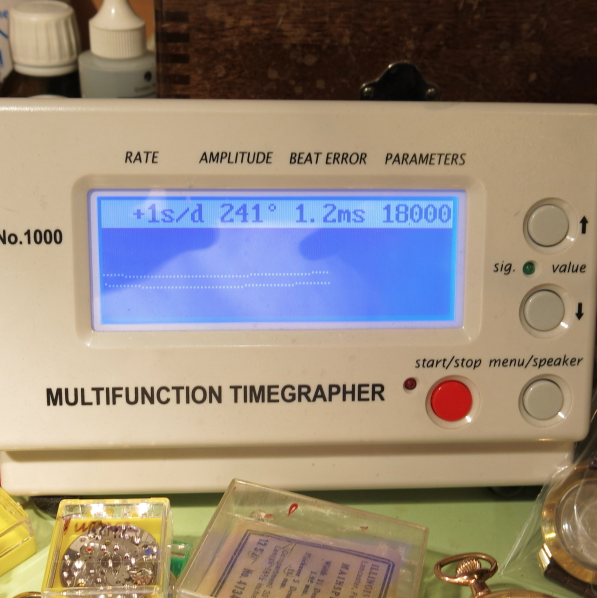 When it starts running I'll put it on the timer. Well, that's not too shabby, 1 second fast per day with good amplitude and a low beat error… maybe my truck was a "getaway car" after all! 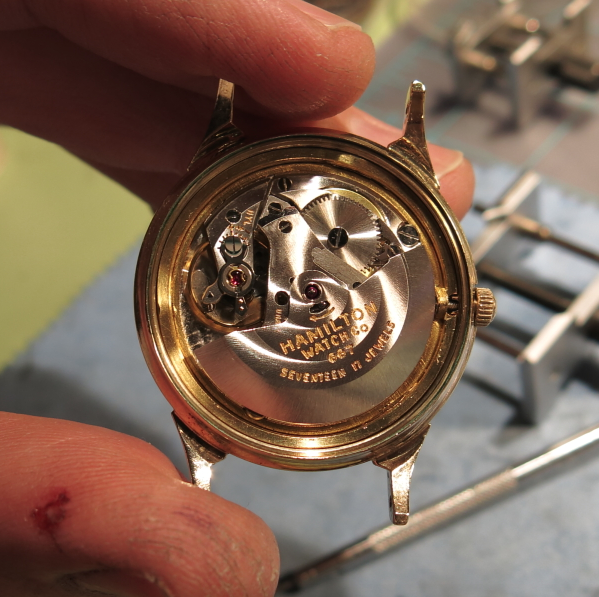 The dial and hands go on next and the movement is ready to go back in the case. 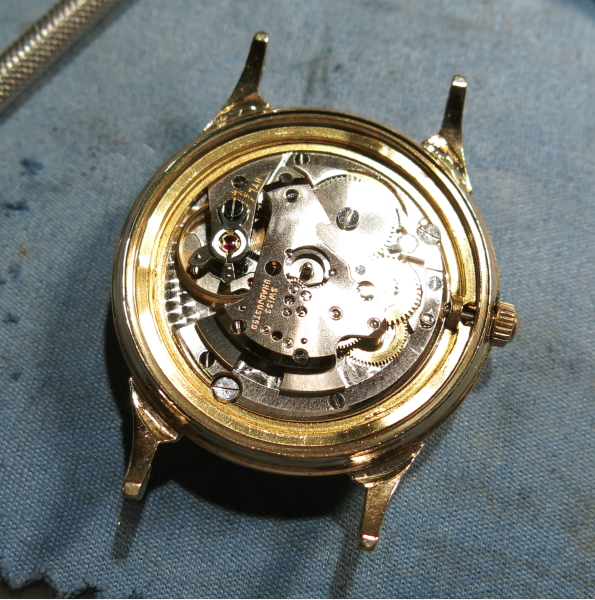 The movement is surrounded by a movement ring and secured with two screws. The rotor goes on last. 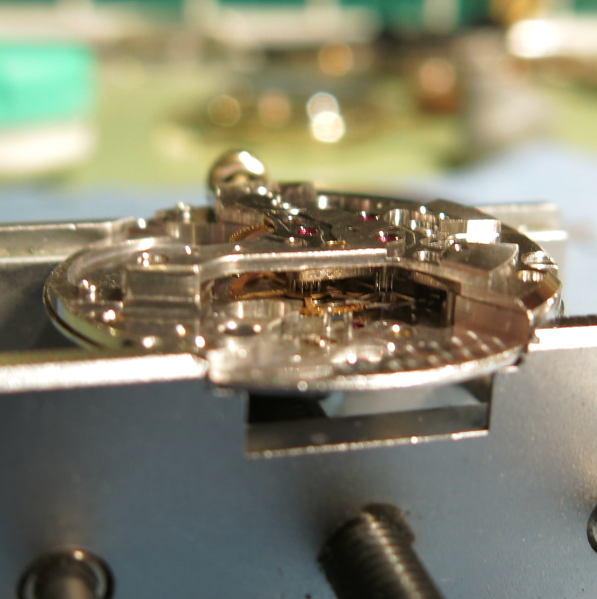 It's easier to put the rotor on last and not have it flopping around while the movement is outside the case. 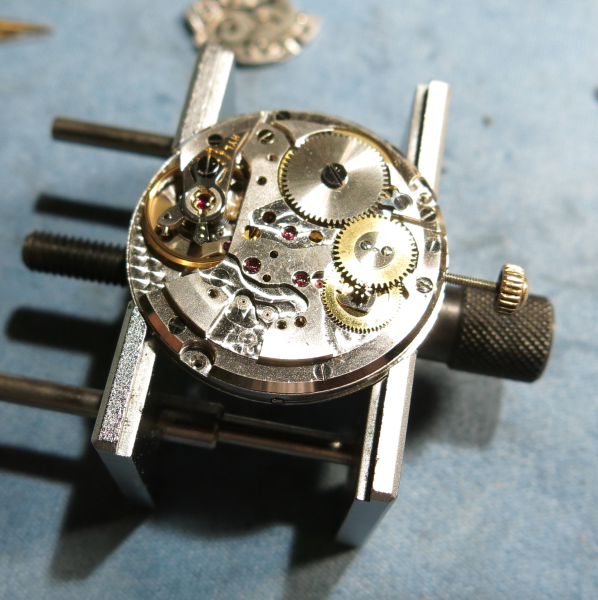 And with a polished case, new crystal and fresh lizard strap - this Automatic K-414 looks awesome! I think I may need to wait a few weeks to go back to my favorite shop and let the heat die down… ha ha!